The first lot of application forms was exhausted by 3 p.m. on April 15, the very day VRL Logistics' initial public offering (IPO) opened. When it closed on April 17, the IPO, issued to raise Rs 468 crore, had been oversubscribed 74 times - the retail portion eight times, the qualified institutional buyers' portion 58 times and the high net worth individual (HNI) portion 251 times - leaving investors, bankers and stock market analysts stunned. The last time an IPO received such a response was Reliance Power in 2008, which was oversubscribed 73 times. "I was reminded of the mid-2000s when the economy was booming and investors would make a beeline to subscribe to IPOs," says Ravi Sardana, Executive Vice President, ICICI Securities. On April 30, VRL Logistics debuted on the bourses at a stock price of Rs 288, 40 per cent higher than its offer price of Rs 205 per share. It is a striking change from the bleakness of the primary market in the past few years. The Sensex and the Nifty may have been at a high but ever since 2011, IPOs and follow-on public offerings (FPOs) have been few and far between, and their performance, tepid. In all of 2013, there were just three of them, raising a modest Rs 1,284 crore. 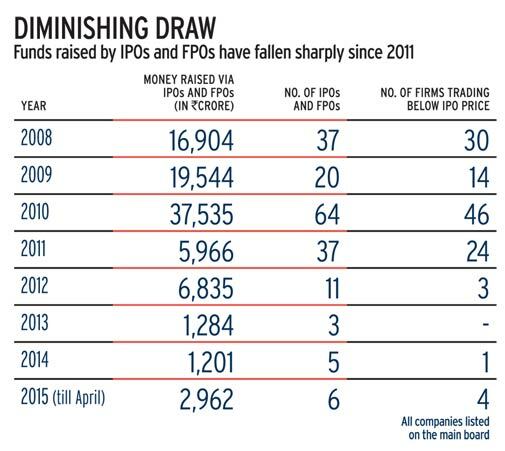 The following year saw five IPOs, but they raised only Rs 1,201 crore. Besides, most of those who invested in IPOs in the last seven years and held on to those companies have lost money - over two-thirds of the IPOs issued between 2008 and 2014 are trading below their opening price. But 2015 seems to be a striking departure from the past. There have already been six IPOs in four months, which raised Rs 2,962 crore. Before VRL Logistics' sterling performance, Inox Wind in March also caused a stir, its Rs 1,020-crore IPO being oversubscribed 18.6 times. The remaining months of the year are likely to see 15-20 more IPOs and FPOs on the main domestic bourse, which hope to raise an estimated Rs 15,000 to Rs 18,000 crore. Though this falls well short of the high of 2010, when 64 IPOs and FPOs were issued raising Rs 37,535 crore, does it imply a revival of the primary market? Analysts are divided in their opinion. "The VRL Logistics IPO shows money is easily available for good issues," says Sardana. "If investors feel confident of making money on an issue, they will be more than happy to latch on to it." Prithvi Haldea, founder of market research firm Prime Database, agrees cautiously. "It may be too early to speak of a revival, but some build-up is certainly taking place," he says. Activity has definitely increased. "In the past week, we have been filing one issue every three hours or so," says Dharmesh Mehta, Deputy CEO at Axis Capital. Not all IPOs of 2015, however, have been successes. In fact, the first two - Ortel Communications and Adlabs Entertainment - performed disastrously. The Ortel IPO raised around Rs 174 crore but remained undersubscribed, while the Adlabs IPO, raising Rs 375 crore, managed full subscription only after extending its closing date by three days and lowering its initial price band. Both saw their stock price fall on their opening day at the bourses. So too, the two IPOs following VRL Logistics have received lukewarm response - MEP Infrastructure's issue managed an overall subscription of just 1.1 times raising Rs 324 crore, while UFO Moviez, raising Rs 600 crore, was oversubscribed twice its issue size. 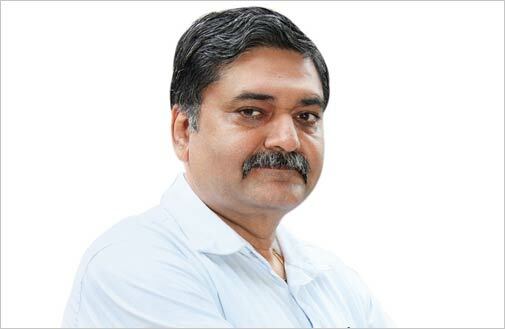 "All issues are not going to be successes," says V. Jayasankar, Senior Executive Director and Head of Equity Capital at Kotak Investment Banking. "One in three issues will be subdued. That does not mean there has been no revival." But there is no dearth of sceptics. 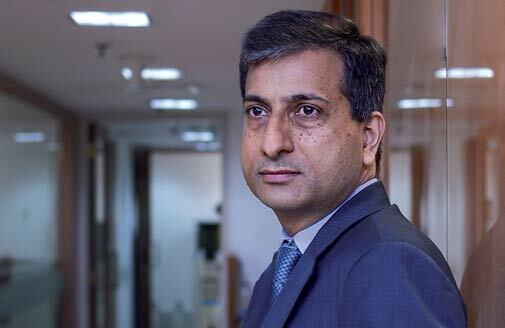 "There are no large issues waiting to hit the market and until we see issues of Rs 2,000 crore or so, I don't think we can call it a revival," says Ashutosh Maheshwari, CEO, Motilal Oswal Investment Advisors. "Unless corporate India undergoes a turnaround, there will be no turnaround of the primary market." For all the government's efforts to boost growth, that prospect still seems far away, with most companies struggling to reduce debt and operating at lowered capacities. One reason why market analysts hesitate to affirm a primary market revival is that a number of the companies which are filing IPOs have private equity (PE) funding. With the life cycle of the funds in these companies coming to a close, and the secondary market - as indeed the bourses overall - doing well, PE firms are anxious to exit and may have pressured the companies to go in for IPOs. UFO Moviez, for instance, saw a 100 per cent offer for sale by its PE investors, Providence Equity and 3i Research. 'Ride the wave while it lasts, but take care to exit before the tide turns,' says RAVI SARDANA, Executive VP, ICICI Securities. Some analysts feel the poor performance of Ortel Communications and Adlabs Entertainment IPOs could well be due to PE pressure making their price bands too high. "When the secondary market is doing well, there is a tendency to price the issue aggressively, but the market rejected those two IPOs," says Haldea. Global PE firms which invested in India have also been affected by the rupee's slide in the past few years and may be keen to cut their losses. "With rupee falling from 37-38 against the US dollar in 2004/05 to Rs 62 now, the PE firms have lost 50 per cent of the value of their investments," says Kejriwal. "They are desperate to exit." How will IPOs fare in coming months? "Mutual funds are flush with cash, with around $10 billion having come in last year, which augurs well for forthcoming IPOs," says ICICI Securities' Sardana. Indeed, some leading mutual funds such as ICICI Prudential Mutual Fund and HDFC Mutual Fund have been anchor investors in recent IPOs. But Kejriwal believes systemic changes are needed for genuine revival. "There is an intrinsic weakness in the way IPOs are priced," he says. "Companies try to fool prospective investors. Anchor investors decide the price and then the company tries to pump it up to that level in the grey market, to lure the retail investor when the issue opens." Investment bankers preparing the issue, oblivious to the interests of ordinary investors, encourage such greed. But the hype does not last once the company lists on the bourses - the share price often tumbles soon. "It was believed bringing in an anchor investor would give stability to an IPO's share price, but something entirely different is happening," he adds. 'There is a herd mentality among investors. Investors rush in without analysing the company.' says ARUN KEJRIWAL, Founder, KRIS. If reform is to be brought about, market regulator Securities and Investment Board of India (SEBI) will have to take the initiative. "It is time the regulator thinks of a new method of pricing IPOs, finds a middle path between the current free pricing and controlled pricing," says Kejriwal. Others accuse the regulator of becoming increasingly slow to clear IPOs. "Earlier SEBI took 45 days, now it takes 75 days on average," says a senior investment banker who does not want to be named. Another major drawback, according to analysts, is that the pool of retail investors in IPOs is not growing. There are no new participants. "New investors will come once IPOs starting making money," says Sardana. "It is not just India. IPO markets have been sluggish across the world following the global slowdown." What kind of companies will come out with IPOs in coming years? "There are few large unlisted companies left in India," Sardana adds. "Going ahead, we will predominantly see listing by mid-sized and small companies. Also, once economic activity improves we can see large conglomerates listing their subsidiaries separately." Adds Jayasankar of Kotak, "This year most issues hitting the market will be around $100 million (Rs 600 crore), while a few will be in the range of $100-300 million." Sardana says there has been a revival, but it will be short-lived. "Given the current momentum, many issues may sail through and investors will make some money," he says. His advice? "Ride the wave while it lasts, but take care to exit before the tide turns."